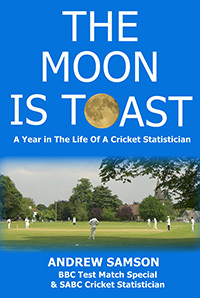 The Moon is Toast, a title gleaned from his young daughter’s comment whilst watching a rare simultaneous eclipse of the moon, is well-known Cricket Statistician Andrew Samson’s account of his year in 2015. Fascinating and illuminating it is too whilst engagingly written. As soon as I had read of its publication, it was one of those books which I was desperately keen to read and it proved to be one of the most entertaining and interesting. Written in the form of a diary, the book is frankly remarkable for what Andrew Samson manages to unearth and let readers – not forgetting his Twitter followers either – know with, on most occasions, a daily statistic or two. Okay, he wittily lets on that people think he might need to get out more but, for those like me who love cricket statistics, we might understand his plight but may not mind if he does stay in... More seriously, Andrew shows the benchmark required to be a cricket statistician. He is, though, very much higher than the benchmark, I would suggest. Andrew shows that he is not just interested in cricket enjoying baseball particularly as well as other sports. With twenty-one flights during the year to various parts of the globes, his diary shows how hectic a top-flight – sorry, no pun intended - cricket statistician can be and what is involved. The odd hours show that the life style must take quite a lot of getting used to. So what arcane – a word Andrew regularly uses – statistics can readers expect to be regaled with in The Moon is Toast? Well, which cricketers have retired with the same number of runs as the year in which they left Test cricket? Which cricketers played the most Tests together before they finally batted together? Who has hit most sixes after the age of 40? You get the idea. Andrew does, though, get out quite a lot. He collects cricket grounds so the reader will be enlightened on some of the more obscure grounds where First-class cricket has been played and he even stopped off in America to watch baseball on his way home from a cricket tour. His amusing comments about Kumar Sangakkara and exhortations not to retire may have fallen on deaf ears but show that he is clearly a fan of the great Sri Lankan. The Cricket Australia XI also features prominently although readers may suspect that this composite XI is not held as highly by the author as Sangakkara. Andrew’s book will, I am sure, delight many people but it also shows what is required and involved in being a cricket statistician. The number of different games which must be followed and added to his own cricket database, the long and strange hours involved and the amount of work required for updating annual books shows that it is very far from being a 9 to 5 job. Understandably, he has his own views which come through in the book but its genial style and Andrew’s dry humour makes The Moon Is Toast an engrossing and thoroughly enjoyable read.